As the Flåmsbana reached the bottom of the line, the small village and port of Flåm came into view. Flåm has a population of 350, but as soon as we arrived its population almost rocketed to 354, for I nearly threw my wife and children out of the window and jumped out after them to take up residency. It was beautiful! Had we become permanent members of the community, perhaps we would not have found it quite as pleasant as it looked at this early hour (we were aiming for the first ferry of the day). Indeed, not all of Flåm appeared as keen to see us as we were to see them. Several residents had what appeared to be bales of hay in their fields, wrapped in plastic, with a large letter painted onto each bale. “NO CRUISE SHIPS” said one; another said “NO GRANDI NAVI” (Italian for “No Large Ships”, a nod to a similar anti-cruise-ship campaign in Venice). This may seem a tad unwelcoming, but the more I think about this the more I can sympathise with Flåm’s residents. 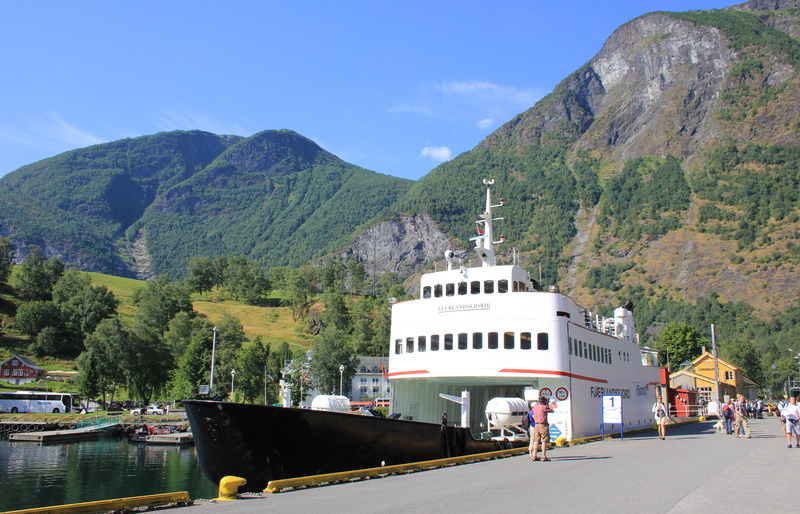 According to the website cruisecritic.co.uk, the beautiful village of Flåm (population 350) is also Norway’s fourth largest cruise port by number of ships, and the fifth largest by number of passengers. 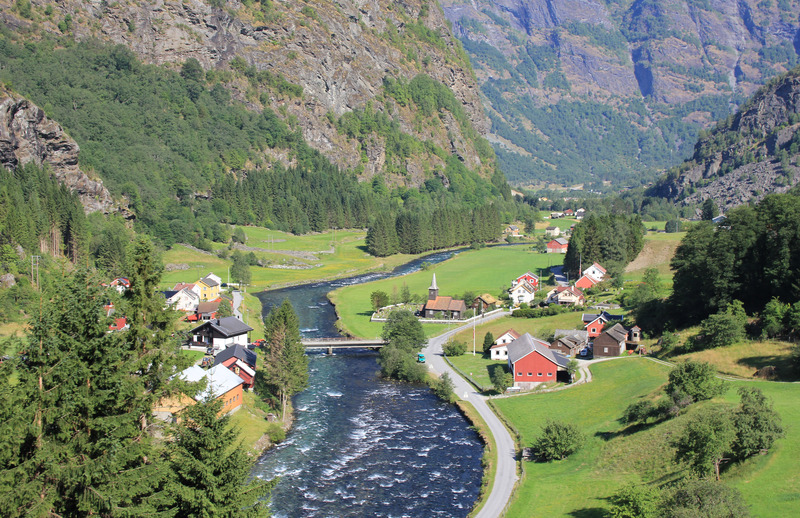 “Several hundred thousand” passengers pass through Flåm each year according to cruisecritic.co.uk. Some may argue that this is great for business, but not all local residents agree. In fact some leave the village during the high tourist season. Locals are inundated by tourists who want to stop and chat at every turn; farmers’ fields are invaded by people wanting to pitch tents. The isolated chance of a troublesome tourist is probably tolerable to most residents, but multiply this chance by several hundred thousand people a year and I begin to see the point. Residents complain that the town smells of oil fumes instead of lush meadow when the big ships arrive. Most accept that the cruises are here to stay, but want to see fewer boats (according to cruisecritic.co.uk 175 cruise ships visit Flåm each year, and that does not include all the smaller ships like ours, of which there were several departures each day, nor the private sight-seeing boats). As for our ferry? It wasn’t a massive beast of a thing. Indeed, it was also laden with a few more tourists than I really cared for (and I say this in full acknowledgement that I was one of them). From a completely selfish point of view I could even see a case for a few more ships with a few less tourists on them! 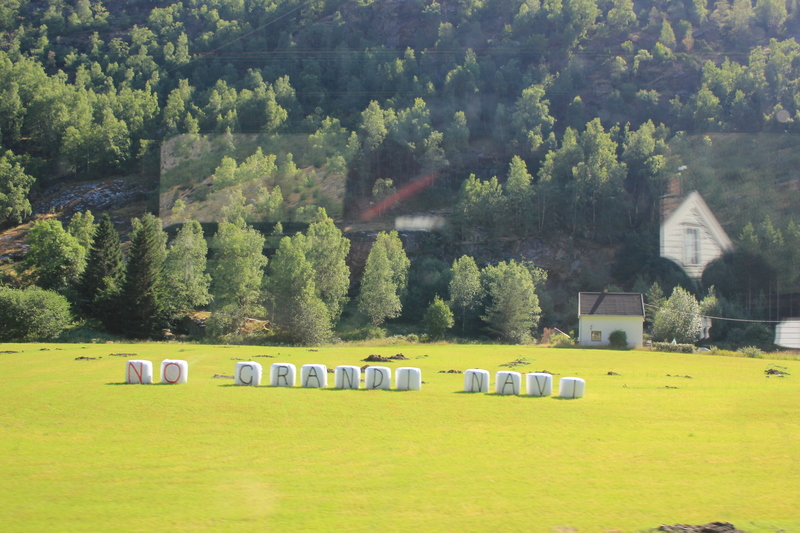 This entry was posted in Norway and tagged fjord, Flam, No Grandi Navi, Norway, Norway in a Nutshell, tourists, travel. Bookmark the permalink. 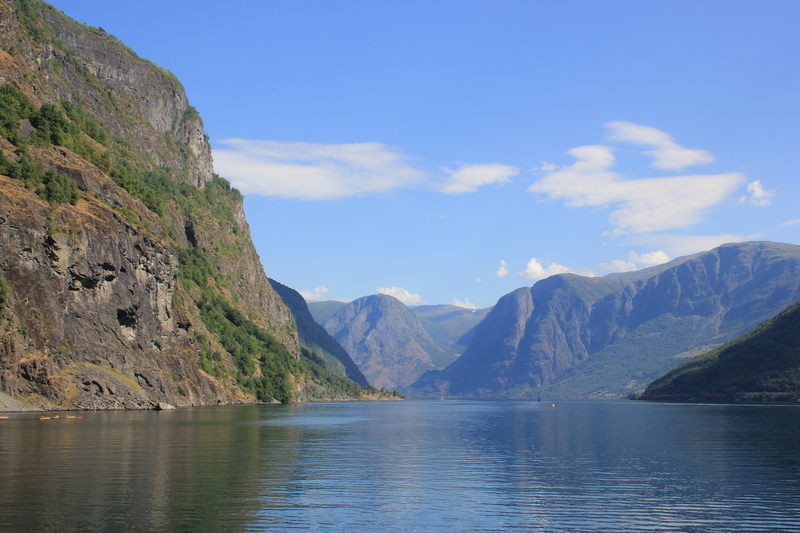 Norway in a Nutshell provides the perfect small boat excursion for a Flam fjord destination. The other enormous ocean liner that also docks in Flam’s harbor simply does not belong there. It is completely out of place in this small quaint area. Additionally passengers on the large ocean liner do not disembark or bring financial benefit to the small businesses in Flam, as they have everything they need onboard the ship (I.e. lodging, food, activities). The large ocean liner totally disrupts picturesque views, adds nothing of value, and drains the area of its magnificent. It’s absolutely time to block the large ocean liner’s entry to Flam’s port for the benefit of the community.